LAKE CHILWA, Malawi, Aug 17 2012 (IPS) - Fisherfolk and farmers living near Malawi’s second-largest water body, Lake Chilwa, are relocating en masse and scrambling for space around its shores as the lake has dried to dangerously low levels. Professor Sosten Chiotha, an expert with the Lake Chilwa Basin Climate Change Adaptation Programme (LCBCCAP), said that it could dry up completely by next year if the low rainfall in the area continued. The lake dried up completely in 1995 following a drought, which saw a resultant rainfall of 775 mm and 748 mm over two consecutive years. According to the Malawi Meteorological Services, for the past two years Lake Chilwa’s catchment area has recorded less than 1,000 millimetres of rain. In 2011 and 2012 the total annual rainfall was 1,048 mm and 655 mm respectively, said Chiotha. And this is not sufficient to sustain the lake. “In March it appeared as if the situation was not too bad, but gradually the water levels started falling rapidly, particularly by the Mposa and Namanja Beaches. In July, we were able to drive 10 kilometres into the lake from Namanja Beach to an area that had water in March, and we still did not reach open waters,” Chiotha told IPS. People living on these main beaches have already started relocating to the Swangoma, Chisi and Kachulu beaches in search of new fishing grounds and good farmland, Chiotha told IPS. However, he was unable to estimate how many people have relocated to date. Chiotha, who is also the regional director of the Leadership of Environment and Development in Southern and Eastern Africa, a global environmental and developmental think tank, cautioned that things could get worse if the lake continued to dry up. “The movement is also causing congestion and potential conflict,” said Chiotha. Up to 1.5 million inhabitants from southern Malawi’s Machinga, Phalombe and Zomba districts benefit directly from the 60 by 40 km lake through agriculture and natural resource goods and services, which generate an estimated 21 million dollars per year. Of that, 18.7 million dollars is generated from fishing, with the remainder coming from farming, bird hunting, and the use of grasslands, vegetation and clay for producing building materials, stated a LCBCCAP brief released in August. About 17,000 tonnes of fish, or 20 percent of all the fish caught in this southern African nation, comes from the lake. Godwin Mussa, 41, who was born on Namanja Beach and lived there his entire life, was forced to move to Chisi Beach in July in search of fishing grounds. “Fishing has been getting harder and harder as the water moved further away from my beach. I just had to move to Chisi so that I can take care of my wife and six children,” Mussa told IPS. He said that his catch had dwindled to an average of 100 fish per week compared to 600 a week last year. “Fishing is my only livelihood and that’s why I just had to relocate. I just hope we will get good rain this year so that I can go back home. The fishermen here are getting wary of those of us who are moving into their territory. We are scrambling for fishing grounds,” said Mussa. Farmers around the lake are also struggling. Debra Chalichi from Phalombe District has been practising irrigation farming within the lake basin since 2007. But this year she had to wait for the rains in order to irrigate her crop. “Since last year, the lake has been moving away from where my garden is. I cannot direct the water channels for irrigating into my garden from the lake anymore because it keeps withdrawing,” Chalichi told IPS. She said that she used to grow rice twice a year, but only managed to grow it once this year as she had to wait for the rainy season. “Rice farming has been my livelihood and I am getting poorer now. I used to make up to 2,000 dollars in sales. But I have only been able to produce rice worth 800 dollars this year,” said Chalichi. Rice is one of Malawi’s staple crops, and is second only to maize. Fifty percent of the estimated 100,000 tonnes of rice harvested in Malawi comes from the Lake Chilwa wetlands, according to statistics from the Ministry of Agriculture. There are no estimates available on this year’s rice production. Chiotha told IPS that the low rainfall was negatively affecting the livelihoods and nutrition of those living around the lake. The situation could force some to leave the area. John Kabango, 51, from Zomba District, has been fishing on Lake Chilwa since 1981. He said that in 2005, the last time the water level in the lake started receding, he relocated to the country’s commercial capital, Blantyre. He worked there as a night guard at a factory until conditions around the lake improved and he returned home. “I never liked the job in Blantyre. I grew up as a fisherman and that is the type of livelihood I am used to. I never managed to make as much money working as a guard anyway and I don’t want to go back to that life,” Kabango told IPS. He said that he earned up to 800 dollars a week from fishing, but was only paid 100 dollars a week to work as a guard. “It was very difficult to take care of my family when I worked as a guard,” said Kabango, who has a wife and six children. But his catch has been dwindling drastically since 2011 when the lake first began drying up. “I used to catch up to 500 fish a night, but I am lucky if I catch 150 now. I am not making as much money and I don’t know if I will manage to take care of my family if the lake dries up,” Kabango told IPS. So he is doing all he can to ensure that he does not have to leave the area. Kabango has joined a LCBCCAP community initiative that is implementing adaptation measures to help locals cope with the low rainfall and the drying lake. “We are digging pools around the lake to allow fish to seek shelter and breed in there as the lake dries up,” said Kabango. He said that farmers were adopting modern methods of irrigation and started using treadle pumps to source water from the lake. While it will not prevent the lake from drying up, it will conserve some of the much-needed water. 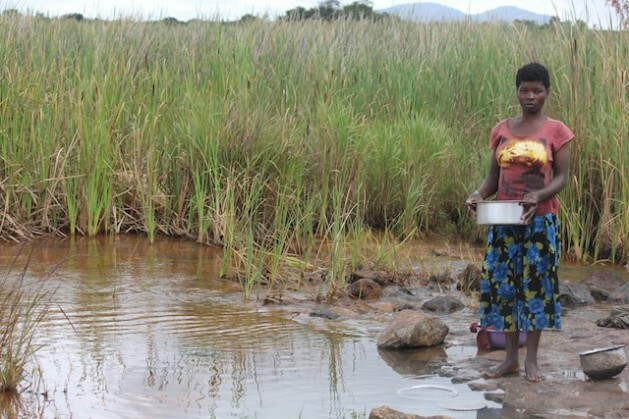 “My wife farms and she is now involved in a rainwater harvesting project so that the water collected is used for irrigation when it is the dry season and the lake has receded further,” said Kabango.